(…continued) Louie did eventually go back to Japan, but not to kill ‘the Bird.’ He took very seriously the words of Jesus about forgiveness, and in his heart he forgave all of his guards and tormentors. This did not happen all at once, but by looking to Jesus and spending time in God’s word and in prayer, Louie began to take hold of this new life, and in time, he became a new person. Louie had heard about a prison where many convicted war criminals were being held, including some he knew. ‘The Bird’ was not there. Word was that he had committed suicide. ‘The Bird’ was the worst, but there were many others who had been very cruel. Louie went into that prison, talked to all of them about the love and forgiveness of Jesus, and then told them he too had forgiven them. There were several Japanese there that Louie knew and remembered, and they remembered him. It was a powerful time. To Mutsuhiro Watanabe: As a result of my prisoner of war experience under your unwarranted and unreasonable punishment, my post-war life became a nightmare. It was not so much due to the pain and suffering, as it was the tension of stress and humiliation that caused me to hate you with a vengeance. Under you, my rights, not only as a prisoner of war but also as a human being, were stripped from me. It was a struggle to maintain enough dignity and hope to live until the war’s end. Only by reading in the book about the relentless suffering Louie endured at this man’s hands can one fully appreciate the miracle of such forgiveness. Louie went on to keep the promise he made on that life raft about serving God. 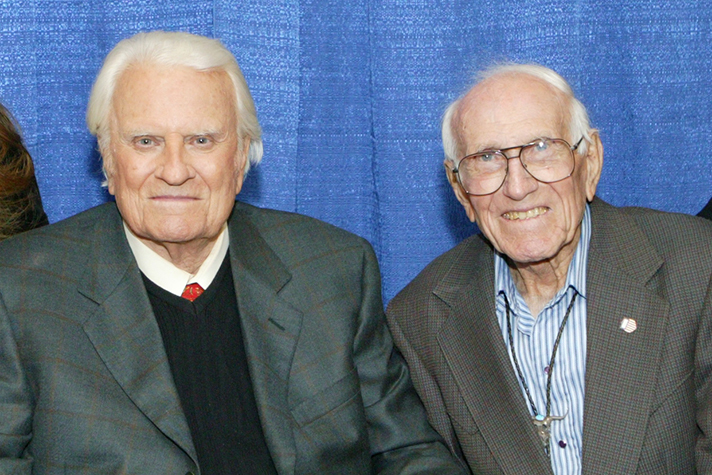 He appeared many times with Billy Graham to tell the incredible story of his life and conversion. And as I said, this is just one of millions of lives who were touched by Billy Graham, who himself was touched and gifted by God in a special way. This hymn was played during the altar call at a revival meeting in 1934 during which Billy Graham went forward and gave his life to Christ. Graham then used it as the altar call hymn in all of his preaching crusades. and that thou bidst me come to thee, O Lamb of God, I come, I come. to thee whose blood can cleanse each spot, O Lamb of God, I come, I come. yea, all I need in thee to find, O Lamb of God, I come, I come. because thy promise I believe, O Lamb of God, I come, I come. now, to be thine, yea thine alone, O Lamb of God, I come, I come. Billy and Louie a few years ago.